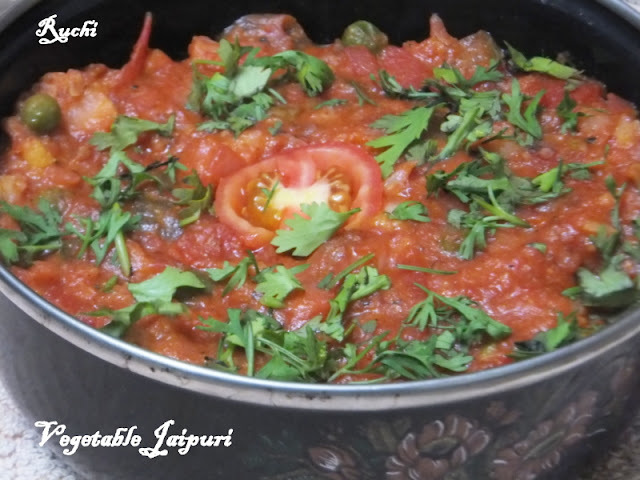 Vegetable jaipuri is a rich dish from the Rajasthani cuisine. I learnt this version from one of my friend .When I went to her house last time, she had prepared this dish for me and I just loved it. 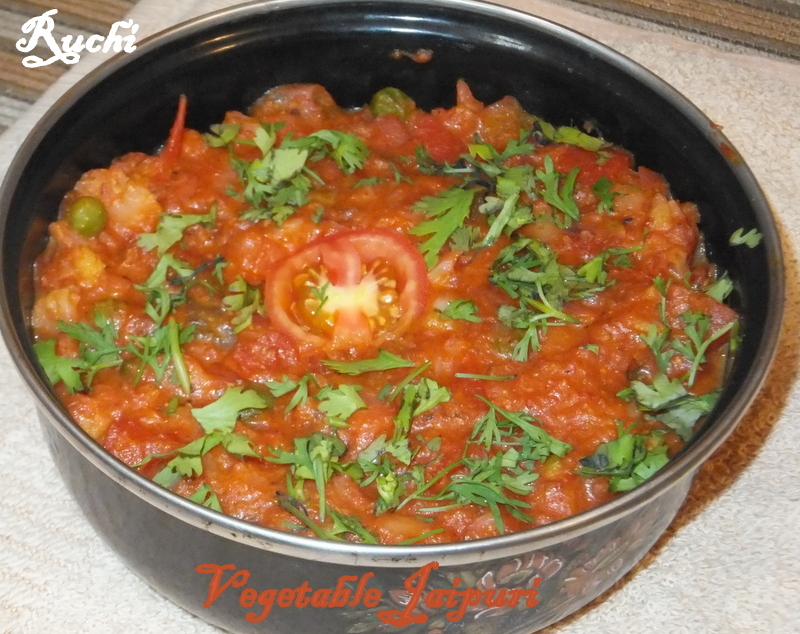 Vegetable jaipuri always consist of variety of vegetables mixed with some kind of masalas. It’s a very tasty and delicious sabzi which goes perfect with paratha, phulka or rice! Boiled all together for 3 minutes into cooker. Mix and grind into paste. 1. Boil vegetables and keep aside. 2. Grind all the ingredients listed above into a grinder and make a paste. Add some water if required. 3. Heat the oil in tava and add the ground paste in it. 4. Then add the dry masala powder and stir till oil separates from the paste. 5. Add all the vegetables in a sequence. First add onion and stir well . 6. They start to cook then add tomato and green peas Lid the pan for about 5 minutes. and cover again for 5 minutes.If you want red color then add chopped beetroot in it. 7. At last add boil vegetables and stir well till the paste gets applied evenly to all the vegetables. 8. Then add turmeric powder, chilli powder, salt, and sugar and let it cook for 8-10 minutes. 9.Mix well and turn off the flame &Garnish with chopped coriander and serve with hot Roti/ parathas. Wow, great looking vegetable jaipuri, love to enjoy with some rotis. Very delicious and colourful curry, will try it.